Don’t have time to play a full game of Phase 10, why not try the Phase 10 Dice game instead? You can play the Phase 10 Dice game with one player, to as many as you can tolerate waiting on. Begin play by having each player roll a dice numbered 5 to 10. The player with the highest roll is first. On your turn, roll all 10 dice one time, setting aside any dice that you would like to keep. Any dice you do not want to keep, you reroll. From the second roll of the dice, choose any dice that you want to keep, finally, roll the remaining dice one more time. You then calculate your score, if any, and play moves to the next player. Sets are a group of dice, all containing the same number. Any number of wild dice (W) can also be used in sets. A run is three or more dice in consecutive numerical order. Any number of wild dice (W) can be used to form Runs. Think flush, and you’ll understand all one color. The dice have to all be the same color. The specific numbers on the dice do not matter. You may use Wild (W) dice, but only if they are the same color as the rest of your flush. Players must play the 10 phases in order. Players score the total, face-value sum of their dice, with Wild (W) dice scoring 0 points. You may only score points for your current phase, and only if you complete that phase on your turn. You may not complete two phases on one turn. 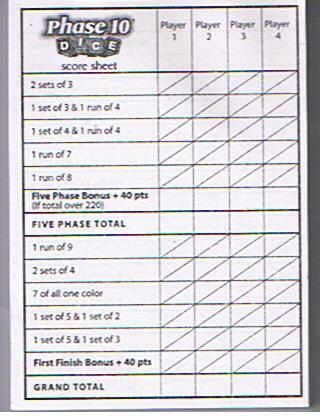 Total your score for the phase on your Phase 10 score sheet. 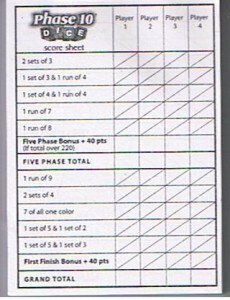 As a player finishes phase 5, they score an additional 40 points if his current score is over 220 points. The first player to complete all 10 phases adds 40 points to his score. If a player began playing the game in a position after the first player to reach phase 10, they are on phase 10 currently, and they complete phase 10, they also qualify for the bonus points. Once a player has reached phase 10, normal play stops. Remaining players have a chance to complete all of their phases, and continue to roll if they complete a phase. For instance, if you are on Phase 8, you would make your normal three rolls to complete the phase. If you failed, your final score is calculated, and your chance is over. However, if you make phase 8, you continue on to phase 9 with three new rolls. If you fail on phase 9, your turn is over and your final score is calculated, but if you succeed, you move on to phase 10. Play continues in this manner for all players. The player with the highest grand total at the end of the game is the winner. The highest score possible is 649. If you achieve a score of 600, Fundex, the makers of the Phase 10 Dice Game, want to know about it. Tell them about your achievement in a letter, and include the signature of one witness.